10/14/2015: Added a link to a web site on P&C. 09/29/2010: Added a P&C 2532 Offset Box Wrench. 09/12/2009: Added a P&C Early 1/2-Drive Universal. 06/22/2009: Added a P&C N-87 Offset Box-End Wrench. 03/22/2009: Added a P&C WF-89 Offset Box-End Wrench. 03/15/2009: Added a P&C 2820 Open-End Wrench. 02/23/2009: Added a P&C 6208 1/2-Drive Universal. 02/18/2009: Updated company history with Eagle lawsuit. 02/09/2009: Added a P&C 2222 Offset Box-End Wrench. 12/23/2008: Added a P&C 6205 1/2-Drive Extension. 11/29/2008: Added a P&C 6071 3/4-Drive Adapter. 03/06/2008: Added a P&C 2718 Combination Wrench. 11/09/2007: Added a P&C N-84 Offset Box-End Wrench. 11/05/2007: Added a P&C 2220E Offset Box-End Wrench. 10/13/2007: Added a P&C 6211 1/2-Drive Ratchet. 05/25/2007: Added a P&C N-86 Offset Box-End Wrench. 05/22/2007: Added a P&C 9206 3/4-Drive Extension. 05/18/2007: Moved to separate page, added a P&C 6008B 1/2-Drive Universal Extension. 03/17/2007: Added a P&C 1708-S Adjustable Wrench. 01/06/2007: Added a P&C 2232 Offset Box-End Wrench. 12/14/2006: Added a P&C 2222-E Offset Box Wrench. 12/13/2006: Added a P&C Ell Handle and a P&C 2225 Offset Box Wrench. 12/12/2006: Added a P&C 2228 Offset Box-End Wrench. 12/11/2006: Added a P&C Ratchet Wrench. P&C is best known as a subsidiary of Plomb Tool (later Proto), but was an interesting and innovative company in its own right. Founded around 1920, the company had developed a very extensive line of automotive service tools by the end of the 1920s. In addition to establishing its own line of tools, P&C also served as the direct or indirect catalyst in the founding of two other tool businesses: Thorsen Manufacturing of Oakland, California, and General Tool of Portland, Oregon. P&C Hand Forged Tools was founded in 1920 as a blacksmith shop in Boise, Idaho. The founders were John N. Peterson and Charles F. Carlborg, both Swedish immigrants and both highly skilled as blacksmiths and machinists. Within a few years P&C had moved to Oregon, first to Lebanon, Oregon and then to Milwaukie (a suburb of Portland). By 1923 the P&C Hand Forged Tool Company was listed in the Polk's Portland City Directory, a business directory covering the Portland area. In 1925 a chance encounter in Portland brought Peterson and Carlborg together with another acqaintance from their Boise days, Edward A. "Ned" Boyd. Perhaps remembering Boyd's skills as a salesman, P&C hired Ned Boyd to set up and manage a new retail operation for the company. The result was P&C Tools Inc., the retail arm for the company. P&C Tools appears to have been a hybrid operation, functioning both as a sales organization for P&C and as a tool distributor for other brands as well. In the late 1920s P&C's business was growing rapidly, and in 1927 Ned Boyd hired John C. Derville Sr. as the assistant manager for P&C Tools. Ned Boyd and John Derville shared another Boise connection, as the two had met in 1919 or 1920 at a mason's meeting in Boise. In 1929 Ned Boyd had a falling out with Peterson and Carlborg in a disagreement over some business matters. The two key issues in the conflict were that P&C wanted to terminate the exclusive sales agreement with Boyd's retail operation, and that P&C wouldn't accept a large tool contract for a major California aviation company. Apparently Boyd had negotiated a major deal with the aviation company, but for tools that would have required retooling the entire factory. Peterson and Carlborg didn't want to abandon their current product line and so refused to accept the contract. The events leading to the founding of Thorsen are corroborated by a newspaper article appearing in the August 1, 1929 edition of the Milwaukie Review. With the heading "Tool Plant to Have New Building Soon" and a byline "Unfounded Rumors Abroad", the article first denies a rumor that P&C was planning to move to Los Angeles or elsewhere, and states that, on the contrary, the company is considering expanding their current operations. Citing John Peterson, the article further notes a rumor that P&C management had sold out and that the company name would change. Peterson indirectly attributes the rumors to a recently organized company in Oakland "with a very similar name", and accuses ex-employees (of P&C) of taking advantage of the reputation of P&C. When he left for California, Ned Boyd sold his stake in P&C Tools to his associate John Derville, and the P&C management then insisted that the retail organization operate as an independent entity. P&C Tools was accordingly renamed to the General Tool Company and continued in operation as a full-line tool distributor, carrying P&C as well as many other brands. General Tool continues today in its 80th year of operations as a family-run business. In the early 1930s Samuel Eagle filed a patent infringement lawsuit against the P&C Hand Forged Tool Company, but in a 1935 decision (Eagle v. P&C Hand Forged Tool Co., 9 Cir., 74 F.2d 918, 920) the court found in favor of P&C. The court determined that the Eagle patent was invalid based on claims in several different prior patents, and this case has been cited in later patent infringement cases as a precedent. The effects of this court decision rippled through the tool industry, as a number of companies that had been making outside-head flex handles switched to the inside-head design. The next major change for P&C came in 1941, when the company was acquired by the Plomb Tool Company of Los Angeles. (See our article on Plomb Tool for more information.) Plomb Tool had similar roots as a blacksmith operation and hand-forged tool maker, but had been growing rapidly under the leadership of Morris Pendleton. Plomb Tool left the operation of P&C largely independent, but made use of the P&C manufacturing facilities for some of Plomb's supply. In 1948 Plomb Tool changed its brand name to Proto following a trademark dispute. In later years P&C continued to prosper as part of the Proto empire, but their tool designs gradually lost their distinctive character and became more like clones of the Proto line. Plomb Tool changed its name to Pendleton Tool Industries in the late 1950s, and in the mid 1960s Pendleton was acquired by Ingersoll Rand, an industrial conglomerate. IR management apparently saw no reason to continue offering multiple brands of similar tools, and in the late 1960s the P&C division was closed. P&C was not very active in the trademark arena, with their only known trademark being the P&C logo. The trademark was filed in 1951 and registered in 1953, with the first use listed as January of 1926. P&C tools can be identified by a distinctive logo consisting of the letters "P&C" in an elongated hex outline. This is referred to as the P&C logo in the text here, and this mark was generally stamped on tools beginning probably in 1926. By 1953 the P&C logo had been registered as a trademark, and some time after this P&C began adding the trademark symbol (R in a circle) to their tool markings, below and to the lower right of the company logo. Information on the early history of P&C is based on recollections of the Derville family, as passed along by another tool collector. The Derville family are the owners of the General Tool Company of Portland, Oregon, a tool distributor now in its 80th year of operations. A new website providing historical information on P&C and its founders is available at www.pnctools.com [External Link]. This site offers biographical information on the founders, as well as early photographs and catalogs. Editions of the Polk's Portland City Directory, a business directory covering the Portland (Oregon) area, are available in the Portland public library. Back issues of the Milwaukie Review newspaper are available on microfiche in the Milwaukie (Oregon) public library. Our catalog coverage for P&C is summarized in the table below. No. 8 P&C Hand Forged Tools 1929 Includes flex handles with "Outside Head" design. No. 30 P&C Hand Forged Tools 1930 Includes flex handles with both "Inside Head" and "Outside Head" design. No. 5300 P&C 1953 Round-shank box wrench 22xx series still listed. No. 61200 P&C 1961 P&C Tool Company, subsidiary of Pendleton Tool Industries, Inc.
P&C tools were carried by some industrial distributors and automotive dealers, and the catalogs of these companies provide valuable information on the company's products. J.E. Haseltime 1923. The 1923 catalog from J.E. Haseltine & Company of Portland, Oregon lists five pages of P&C tools. The tools listed include speeder wrenches, socket wrenches, and box-end wrenches with hex openings. All of the tools are made as one-piece forgings, and the catalog notes the use of chrome vanadium steel. This is currently our earliest catalog reference for P&C tools. Woodbury "C" 1936. The 1936 catalog "C" from Woodbury & Company (Portland, Oregon) contains extensive listings of P&C tools covering 15 pages. Included in the listings are flex handles in both the P&C original ("Outside") design and the Eagle ("Inside") design. Fig. 1. P&C 1/2-Drive Ell Handle, with Inset for Marking Detail. Fig. 1 shows an early P&C 1/2-drive Ell handle, stamped with the P&C logo. Fig. 2. P&C 6008B 1/2-Drive Universal Extension, ca. 1920s. Fig. 2 shows an early 1/2-drive P&C 6008B universal extension, marked with the P&C logo. This tool is not marked with a model number, but was identified by the illustration in the 1929 P&C catalog No. 8. The catalog shows a price of $1.90 net to the trade. Fig. 3. P&C 6205 1/2-Drive 10 Inch Extension, with Insets for Marking Detail. Fig. 3 shows a 1/2-drive P&C 6205 10 inch extension, stamped with the P&C logo and model number. Fig. 4. P&C Early  1/2-Drive Universal. Fig. 4 shows an early P&C 1/2-drive universal, stamped with the P&C logo on the base. Although not marked with a model number, this is believed to be an early 6208 universal. The overall length is 2.3 inches, and the finish is plain steel. Fig. 5. 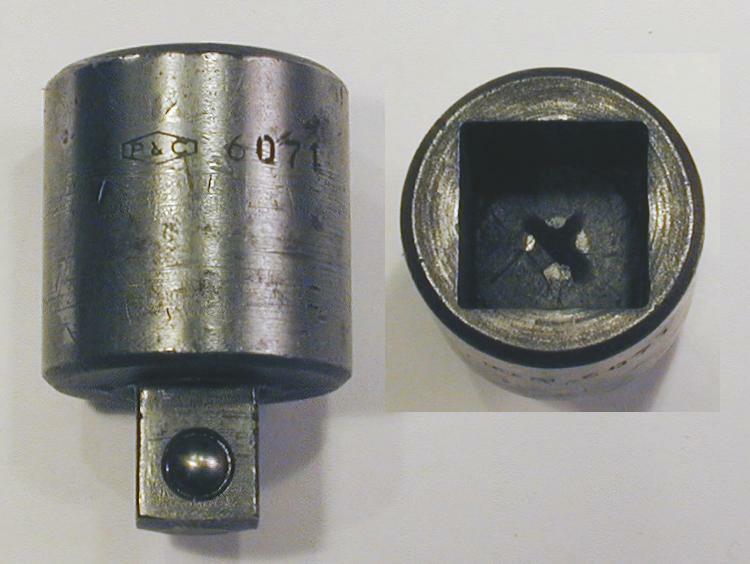 P&C 6208 1/2-Drive Universal, with Inset for Marking Detail. Fig. 5 shows a later 1/2-drive P&C 6208 universal, stamped with the P&C logo and model number. Fig. 6. P&C 6211 1/2-Drive Ratchet, with Inset for Side View. Fig. 6 shows a 1/2-drive P&C 6211 ratchet, marked with the model number and P&C logo. Fig. 7. P&C 6071 3/4-Drive To 1/2-Drive Adapter, with Inset for End View. Fig. 7 shows a P&C 6071 3/4-drive (female) to 1/2-drive (male) adapter, marked with the P&C logo and model number. The overall length is 1.9 inches, and the finish is plain steel. Fig. 8. P&C 9206 3/4-Drive Extension, with Inset for Marking Detail. Fig. 8 shows a 3/4-drive P&C 9206 15 inch extension, marked with the P&C logo and model number (see inset). The overall length is 15.2 inches. Fig. 9. P&C Early 9/16 Ratcheting Box Wrench. Fig. 9 shows an early P&C 9/16 hex ratcheting box wrench, stamped with the P&C logo on the shank. P&C's box wrenches have a distinctive style that deserves a note here. On P&C box wrenches the box ends are forged with tapering walls resembling a conic section, so that the downward edge is somewhat thinner than the top. In contrast, most other makers produced box wrenches with slightly rounded walls. Recently we noticed that certain early Bonney specialty wrenches also have tapering box ends, although Bonney's standard box wrenches all have the more common rounded surface. These Bonney specialty box wrenches were in production as early as 1928 (see for example the Bonney 2540 Main Bearing Wrench), probably around the same time that P&C started making box wrenches. The 1929 P&C catalog No. 8 offered a main bearing wrench that closely resembles the Bonney 2540 model. At this point it's not known whether the resemblance of the two brands is accidental, or if possibly a sample wrench made its way across the country (in either direction) and influenced the other's design. Later Thorsen box wrenches also closely resemble the P&C examples, but here the influence is well understood -- Thorsen hired away one of P&C's die makers to help start the company. Fig. 10. P&C 2220-E 9/16x5/8 Offset Box-End Wrench, with Inset for Side View. Fig. 10 shows a P&C 2220E 5/8x11/16 offset box-end wrench, marked with the P&C logo stamped on the shank. The overall length is 9.3 inches, and the finish is nickel plating, with some loss due to wear. Fig. 11. P&C 2222-E 5/8x11/16 Offset Box-End Wrench, with Inset for Side View. Fig. 11 shows a P&C 2222-E 5/8x11/16 offset box-end wrench with the P&C logo stamped on the shank. The overall length is 9.7 inches, and the finish is plain steel. Fig. 12. P&C 2222 5/8x11/16 Offset Box-End Wrench, with Inset for Side View. Fig. 12 shows a P&C 2222 5/8x11/16 offset box-end wrench, marked with the P&C logo stamped on the shank. Fig. 13. P&C 2225 3/4x25/32 Offset Box-End Wrench, with Inset for Side View. Fig. 13 shows a P&C 2225 3/4x25/32 offset box-end wrench with the P&C logo stamped on the shank. The overall length is 11.0 inches, and the finish is chrome plating with polished ends. Fig. 14. P&C 2228 3/4x7/8 Offset Box-End Wrench, with Insets for Side View and Marking Detail. Fig. 14 shows a P&C 2228 3/4x7/8 offset box-end wrench with the P&C logo stamped on the shank. The overall length is 12.1 inches, and the finish is plain steel. Fig. 15. P&C 2232 15/16x1 Offset Box-End Wrench, with Inset for Side View. Fig. 15 shows a P&C 2232 15/16x1 offset box-end wrench with the P&C logo stamped on the shank. The overall length is 14.7 inches, and the finish appears to be nickel plating, though darkened by rust. Fig. 16. P&C 2532 15/16x1 Offset Box-End Wrench, with Insets for Side View and Marking Detail. Fig. 16 shows a P&C 2532 15/16x1 offset box-end wrench, stamped with the model number and P&C logo. The overall length is 13.8 inches, and the finish appears to be cadmium plating. Fig. 17. P&C N-84 13/16x7/8 Offset Box-End Wrench, with Insets for Side View and Marking Detail. Fig. 17 shows a P&C N-84 13/16x7/8 offset box-end wrench, stamped with the P&C logo. Fig. 18. P&C N-86 1-1/16x1-1/8 Offset Box-End Wrench, with Insets for Side View and Marking Detail. Fig. 18 shows a P&C N-86 1-1/16x1-1/8 offset box-end wrench, stamped with the P&C logo and fractional sizes. The overall length is 15.1 inches, and the finish is cadmium plating. Fig. 19. P&C N-87 1-1/4x1-5/16 Offset Box-End Wrench, with Insets for Side View and Marking Detail, ca. 1942-1945. Fig. 19 shows a P&C N-87 1-1/4x1-5/16 offset box-end wrench, stamped with the P&C logo and fractional sizes. The overall length is 17.1 inches, and the finish is plain steel with pitting due to rust. Fig. 20. P&C WF-89 1-7/16x1-1/2 Offset Box-End Wrench, with Insets for Side View and Marking Detail, ca. 1942-1945. Fig. 20 shows a P&C WF-89 1-7/16x1-1/2 offset box-end wrench, stamped with the P&C logo and fractional sizes. The overall length is 19.9 inches, and the finish is cadmium plating. The construction of this wrench is very similar to the P&C N-8x series of box wrenches, but the unusual WF-89 model number indicates that the wrench was supplied to Plomb Tool as part of their WF-series military contract. Fig. 21. P&C 2820 9/16x5/8 Open-End Wrench. Fig. 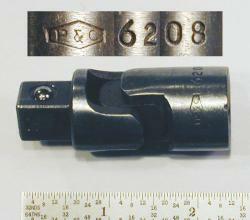 21 shows a P&C 2820 9/16x5/8 open-end wrench, stamped with the P&C logo on the shank. Fig. 22. 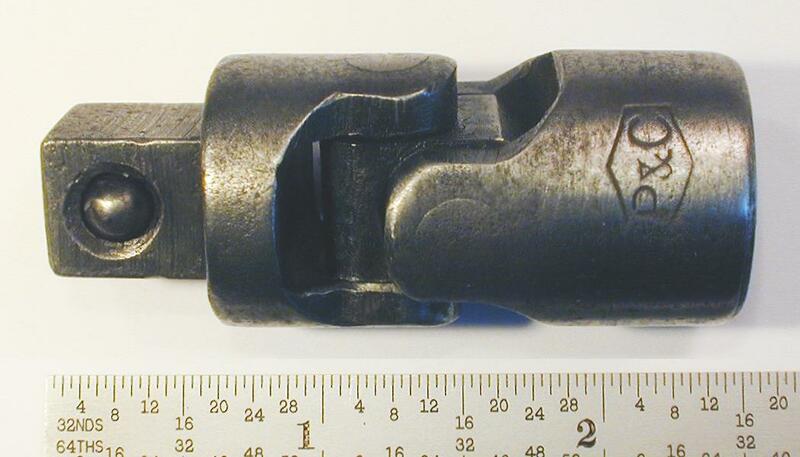 P&C 2718 9/16 Combination Wrench, with Inset for Side View. Fig. 22 shows a P&C 2718 9/16 combination wrench, stamped with the P&C logo on the shank. After the acquisition by Plomb Tool, P&C continued to operate as a quasi-independent division of Plomb (later renamed to Pendleton Tool Industries) until sometime in the late 1960s. During this period the P&C branded tools gradually lost their distinctive character as the tool lines for the various divisions were "harmonized". In addition, many P&C branded tools were actually made by other factories within the corporate structure, in order to maximize the economies of scale for each company unit. In this section we'll show a few examples of late P&C branded tools, and more examples can be found in our article on P&C within the Proto Empire. Fig. 23. P&C 1234 Compound-Leverage Slip-Joint Pliers, with Inset for Side View. The overall (extended) length is 8.3 inches, and the finish is chrome plating with polished faces. The full patent number was found to be patent #2,600,512, issued to H.A. Mead in 1952. This patent was also used by Proto for its equivalent model. An example of Proto's version can be seen as the Proto 234 Pliers. Fig. 24. P&C 1708-S 8 Inch Adjustable Wrench, with Inset for Side View. Fig. 24 shows a P&C 1708-S 8 inch adjustable wrench, stamped with the P&C-Logo and a registered trademark symbol, and with "Forged Alloy Steel" in forged raised letters. The overall length is 8.1 inches, and the maximum opening is 1.0 inches. The maximum head thickness was measured at 0.50 inches. This example is finished in black oxide, as indicated by the "S" suffix to the model number. Adjustable wrenches were also available with a chrome plated finish. A forged-in code "P55" can be seen on the shank at the right. As part of the Proto Empire, P&C's adjustable wrenches were made by the J.P. Danielson company, another company acquired by Plomb Tool in the 1940s. Other examples of Danielson production can be seen as the Danielson "Bet'R-Grip" 6 Inch Adjustable Wrench, Plomb 706 Adjustable Wrench, and Vlchek AV6 Adjustable Wrench.